What's new in ASP.Net Core MVC? In this blog, we will see What's new in ASP.Net Core MVC?. This is my very first blog on ASP.Net Core MVC. After MVC version 5, ASP.Net Core MVC 1.0 and ASP.Net Core MVC 2.0 has been launched in year 2016 and 2017 respectively. Features of ASP.Net Core MVC? The very first feature is, ASP.Net Core MVC is platform independent. It means Core MVC will run on other OS as well apart from Windows. Remember, there are no changes on MVC pattern level in ASP.Net core MVC. Few changes are there like no web.config, no global.asax file which we will see later in this blog. So, let's start by creating Core MVC project in Visual Studio. I am using Visual Studio 2017, this version of Visual Studio is more favorable than other versions, this is my personal opinion. You can use Visual Studio 2017 community edition, its free for individuals, freelancer, students. Open Visual Studio 2017, and create new Project. 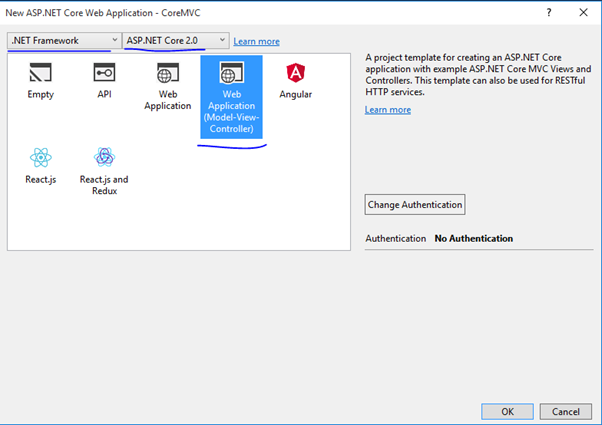 Select ASP.NET Core Web Application as shown in below screen. If you select the Empty type, then you have to add all the necessary folders, packages, dlls manually to run Core MVC application. If you select Web Application (Model-View-Controller), then all the related folders, packages will be added to your projects. So, you may select as per your need. In my case, I have selected Web Application (Model-View-Controller). 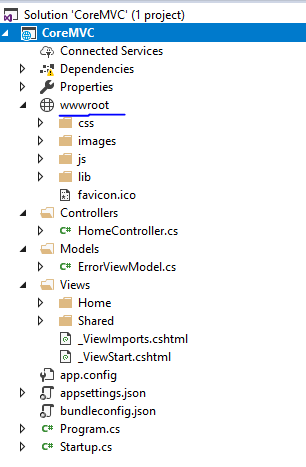 Once your ASP.Net Core MVC application is created, you can see a slightly different folder structure in solution explorer. You may found 3 methods in startup.cs file. Adding a Model, View or Controller is similar to ASP.Net MVC 4 or MVC 5. There are no differences in doing these process. One more difference I found in Action method in Controller class. One other side, in Core MVC default return type for an Action method is an interface IActionResult. Follow SharePointCafe.Net to update yourself on all latest Microsoft technologies.